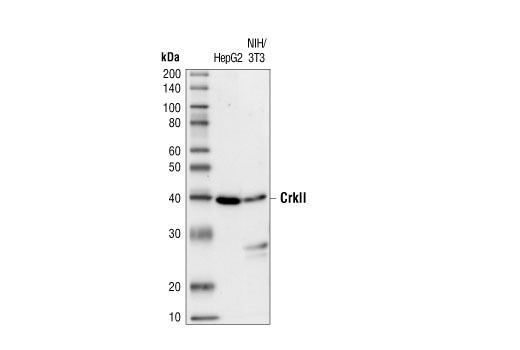 Western blot analysis of extracts from HepG2 cells (human hepatocellular carcinoma) and NIH/3T3 cells (mouse fibroblasts), using CrkII Antibody. CrkII Antibody detects endogenous levels of CrkII protein. This antibody does not cross-react with related proteins. Polyclonal antibodies are produced by immunizing animals with a synthetic peptide corresponding to residues surrounding Trp169 of human CrkII protein. Antibodies are purified by protein A and peptide affinity chromatography. CrkII, a cellular homologue of v-Crk, belongs to a family of adaptor proteins with an SH2-SH3-SH3 domain structure that transmits signals from tyrosine kinases (1). The primary function of Crk is to recruit cytoplasmic proteins in the vicinity of tyrosine kinases through SH2-phospho-tyrosine interaction. Thus, the output from Crk depends on the SH3-binding proteins, which include the C3G and Sos guanine nucleotide exchange proteins, Abl tyrosine kinase, DOCK180 and some STE20-related kinases. The variety of Crk-binding proteins indicates the pleiotropic function of Crk (2). The two CrkII SH3 domains are separated by a 54 amino acid linker region, which is highly conserved in Xenopus, chicken and mammalian CrkII proteins (3). Tyrosine 221 in this region is phosphorylated by the Abl tyrosine kinase (4), IGF-I receptor (5) and EGF receptor (6). Once Tyr221 is phosphorylated, CrkII undergoes a change in intramolecular folding and SH2-pTyr interaction, which causes rapid dissociation of CrkII from the tyrosine kinase complex (3). Zvara, A. et al. (2001) Oncogene 20, 951-961. Kiyokawa, E. et al. (1997) Crit. Rev. Oncog. 8, 329-342. Rosen, M.K. et al. (1995) Nature 374, 477-9. Amoui, M. and Miller, W.T. (2000) Cell. Signal. 12, 637-643. Koval, A. P. et al. (1998) Biochem. J. 330, 923-932. Hashimoto, Y. et al. (1998) J. Biol. Chem. 273, 17186-17191.